Imitation bamboo colored stainless steel profiles for its vivid, elegant, has a strong effect simulation bamboo and reasonable structure, high strength. Imitation bamboo profiles from special chrome alloy steel (the chrome steel) materials processing molding, then the surface electrostatic powder coating process (commonly known as the spray) together. Electrostatic powder coating company's products are used by the company signed an exclusive supplier of Swiss foreign - Akzo Nobel (Langfang) Co., Ltd. produced. The agreement stipulated in the contract period, I can not use other companies electrostatic powder. With the world's most authoritative, most forces of electrostatic spraying powder as our backing, our products surface coating bright colors, durability, engage in highly aging, surface coatings can not guarantee two years off. Special chromium alloy stainless steel substrate is the product of another anti-rust capability that two anti-rust measures to ensure the product will not rust (itself is made of stainless steel to rust what? ). Imitation bamboo series products by professional industrial designers complete. The company's imitation bamboo products in the structure as much as possible in line with the principles of mechanics, on the basis of compliance with the above principles of mechanics to complete the open, bold art and design. At the intersection of aesthetics and mechanics of finding the best combination of the two indicators of both the product itself and the power of art. Imitation bamboo fence will give municipal construction, landscaping and landscape design select fence products play a revolutionary change, with the perfect combination of green lawn. Our series of colored stainless steel imitation bamboo fence compared to traditional PVC fence has obvious advantages, high strength, weather resistance, good looks, innovative style. We changed the lawn fence stiff and fragile, "winter disease" (winter is bad) the general impression. 1)The fence bamboo tube with Φ38 and Φ19 bamboo tube, special chrome alloy steel pipe. 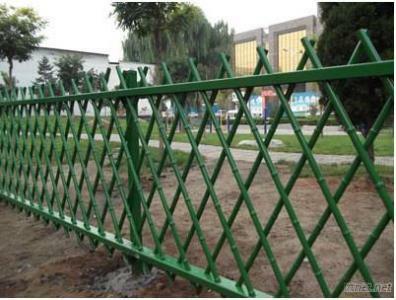 The fence height from the product used to 75 cm high 45 cm high, column spacing of 1.52 m. Square columns and beams are connected to the accessory is connected, the small beam connecting rods and also after drilling spot welds. The product is small bars all Triangle, in full compliance with the requirements of mechanics, bending its overall performance is very strong. Elegant retro style, overall nice, colorful. And the surface electrostatic powder coating color can be adjusted. Widely used in the park lawn fences, pool fences flowers side street. 2)A fence and the model is basically the same type of fence, using bamboo pipe Φ38 and Φ19. Products used height from 45 cm to 75 cm high high, column spacing of 1.52 m.